Representatives from CN-DA, ASIPP, and the ITER Organization participating in the signing ceremony in Beijing this week for the ITER magnet feeders. 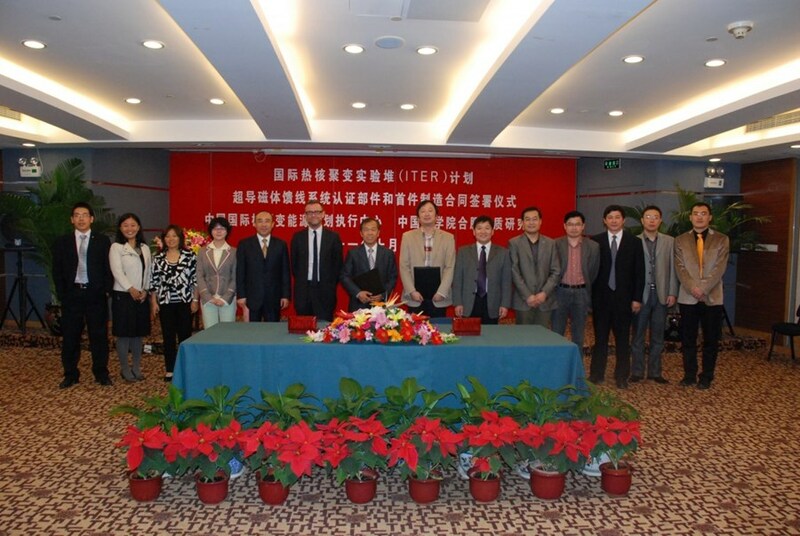 A contract award ceremony in Beijing this week marked the transition from design to manufacture for ITER's magnet feeders. ITER's 31 magnet feeders will convey and regulate the cryogenic liquids to the magnets for cooling purposes and also connect the magnets to their power supply. On 16 October, contracts were signed between the Chinese Domestic Agency (CN-DA) and the Institute of Plasma Physics at the Chinese Academy of Science (ASIPP) for feeder process qualification and for the manufacture of four prototypes. 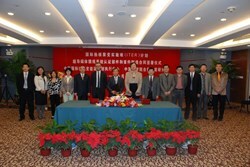 Representatives from CN-DA, ASIPP, and the ITER Organization participated in the signing ceremony. Luo Delong, head of the CN-DA, expressed his appreciation for the design, R&D, and quality system improvement efforts made by ASIPP in the last few years through financial support from the Chinese Ministry of Science and Technology; these efforts will significantly benefit the implementation of the contract. ASIPP will now ensure that the manufacture of the magnet feeders for ITER can be completed according to the strict quality and schedule requirements of the ITER Organization. Director LI Jiangang, on behalf of the ASIPP, expressed his appreciation for the consistent support from the CN-DA and made a commitment that ASIPP will spare no effort to fulfill its contractual responsibilities through close cooperation with the CN-DA and the ITER Organization.